Argus Home Security Solutions have been making Security Doors in Canberra for 38 years. Therefore we know what it takes to keep your home safe and secure. We manufacture security screens for doors and windows in our Hume warehouse. No matter what your budget or design, we have a security screen for you. Feel safe with peace of mind with a security door from Argus Home Security Solutions. 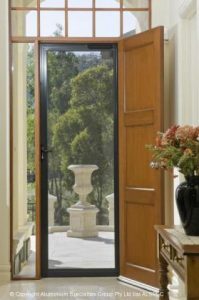 Why Choose a Security Screen Door in Canberra? Unlike most of us, thieves dont take time off over holidays. our crime statistics show that the average number of burglaries in the ACT equate to around 30,000 per annum. This makes security doors an important part of any home, not only for your belongings but for your safety as well. Argus manufactures a diverse range of quality security doors including the INVISI GARD range, endorsed by World Champion Boxer Danny Green. At Argus, we have a range of products to suit all homes and budgets. All our security screens are manufactured in our Hume workshop, custom built to fit your door frame perfectly. A door that is made to measure looks neater and further enhances security. Argus Home Security Solutions can rekey your new door to match an existing key in most cases. If this is not possible, any doors installed as part of the same order will be supplied keyed alike. Lock heights will adhere to Australian Standards. INVISI GARD provides optimum security without compromising visibility, therefore a perfect addition to any entry. This also provides safety without bars and grilles. Kids, cats, dogs and burglars have met their match with INVISI GARD! We manufacture INVISI GARD Security doors in our Hume workshop. We manufacture them using high tensile 316 marine grade stainless steel mesh. A unique patented retention system fixes the mesh to the Aluminium frame. This system does not require screws or any other form of mechanical fixing to secure the mesh therefore removing the possibility of corrosion. Available for single or sliding doors. Invisi Gard has a powder coated frame, high quality locks and fixtures and anti-corrosion mesh. Your INVISI-GARD door is built to last with a 15 year warranty. Our traditional diamond grille security screens are built in Canberra with quality and strength that is essential when securing your home. Our made to measure doors pass Australian Standards. A triple lock, 3 hinged, polycarbonate lock guard and a quality Whitco lock with locking snib feature come standard. Customise the look of your door with our large range of powder coat colours. Choose between fibreglass, one-way vision, pet mesh or tough mesh. Colonial Castings give a traditional look to your home. They are available in a wide range of patterns to suit hinged and sliding doors, as well as sidelight panels. Colonial Castings have a single point lock and fibreglass mesh . One-way, pet or tough mesh are also available. Or decide on high tensile stainless steel Invis igard mesh which cannot be penetrated. A triple lock as standard provides complete security. Choose from a wide range of available colours for the powder coated frame and panels.